I don’t want to think about it being late August, or August at all. I don’t want to think about summer ending and taking with it its bounty of everything good. I don’t want to think about the ice cream maker that will sit collecting dust for a year, or about the peaches I won’t taste all winter. 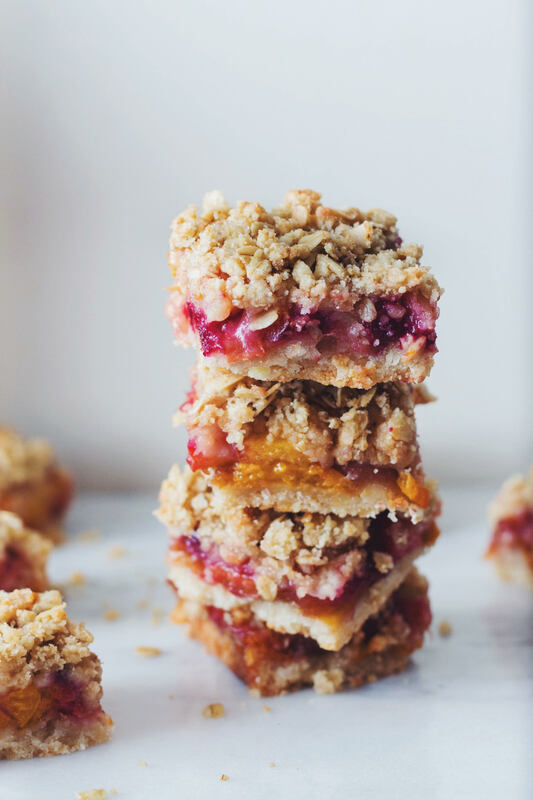 I will make Spiced Stone Fruit Crumble Bars! Please note: the above list is not written in order of importance. In fact, I think the last bullet point may be the most important, because it is everything, everything I love about summer: spiced and sugared fruits, tucked between two crumbly layers, baked until jammy and gooey, and then cut into bars which, did I mention, are the easiest thing ever to make? Because they are. 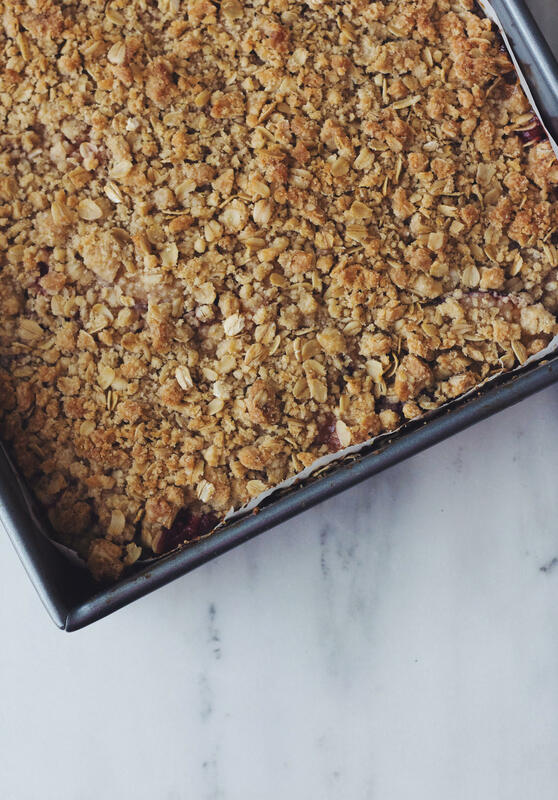 The crust and the crumble are basically one and the same, the fruits are merely sliced and spiced and the whole thing bakes for less than an hour. 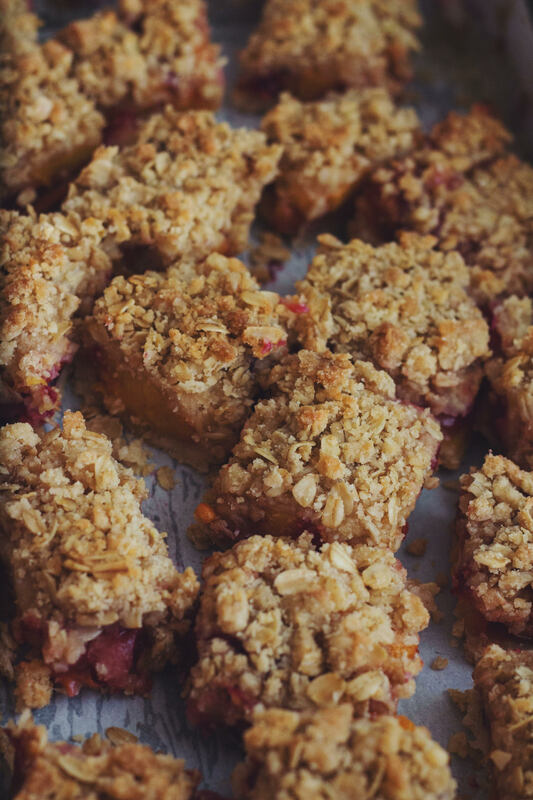 The resulting bars are lightly spiced, tart with apricots, lush with peach juice, and singing with sweet plum flavor. They’re like shortbread on the bottom, like crumble on top, and best of all, they freeze beautifully, which means you can make a tray, freeze it, and bake it in October, when the apples and pumpkins are inescapable. It’s like instant summer, in bar form. And I’m a big, big proponent of such a thing. Why I love this recipe: in a twist of simplicity, both the crust and the crumble are comprised of one dough, which turns shortbread-like on the bottom and stays crisp and buttery on the top. The fruits are spiced and flavored with whiskey, molasses and vanilla and they turn jammy, tart, sweet, and incredibly flavorful. Notes: these bars freeze, unbaked, for a few weeks. Simply remove them from the freezer and bake for five or ten minutes longer than what I’ve written below. The fruits listed below are a combination that I found yielded a perfect amount of sweet/tart flavor. You can play around with the amounts (substituting, for example, more peaches for plums), but make sure you’re getting the same yield at the end. Preheat the oven to 375 degrees F. Grease and paper a 9×13 inch pan. In a medium bowl, stir together 1 cup sugar, 1 teaspoon fine sea salt, baking powder and 3 cups flour. Using a spatula or a fork, blend in the butter and egg. The dough will be crumbly. Pat half of it into the prepared pan. To the other half of the dough, add the remaining salt, the oats and the dark brown sugar. Combine and set aside until needed. In another bowl, stir together the fruit, sugar, cornstarch and spices. Add the molasses, vanilla extract and whiskey. Gently mix to combine. Sprinkle the mixture evenly over the crust. Thickly scatter the remaining crumble over the fruit. Bake in preheated oven for 45-55 minutes, or until top is slightly brown. 21 Aug	This entry was published on August 21, 2015 at 11:11 am. 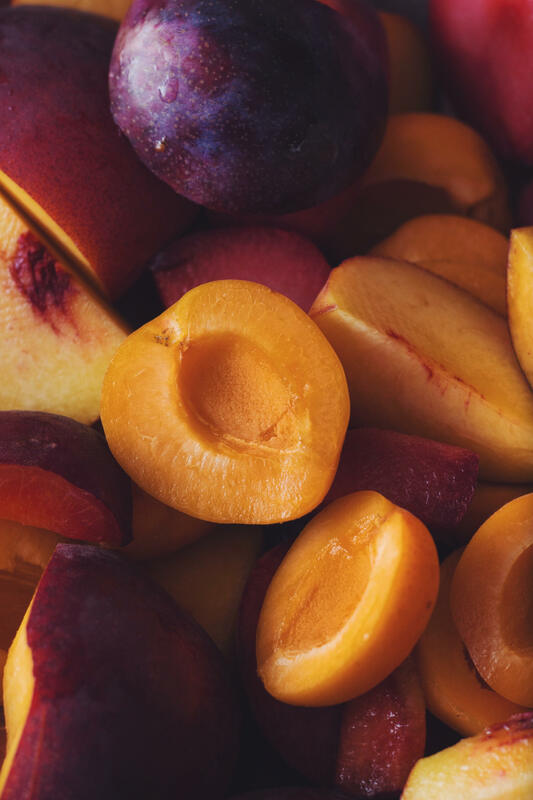 It’s filed under Delectables and tagged apricots, august, baking, bars, butter, crumble, delicious, dessert, food, peaches, photography, plums, recipes, seasonal, stone fruit, sugar, summer. Bookmark the permalink. Follow any comments here with the RSS feed for this post.